I thought of sharing today about our front yard, there’s not really a garden that I’ve put much effort into. When we arrived here last year, there were already some trees like the malunggay and the atis (but this one died because of the Habagat flood last year). 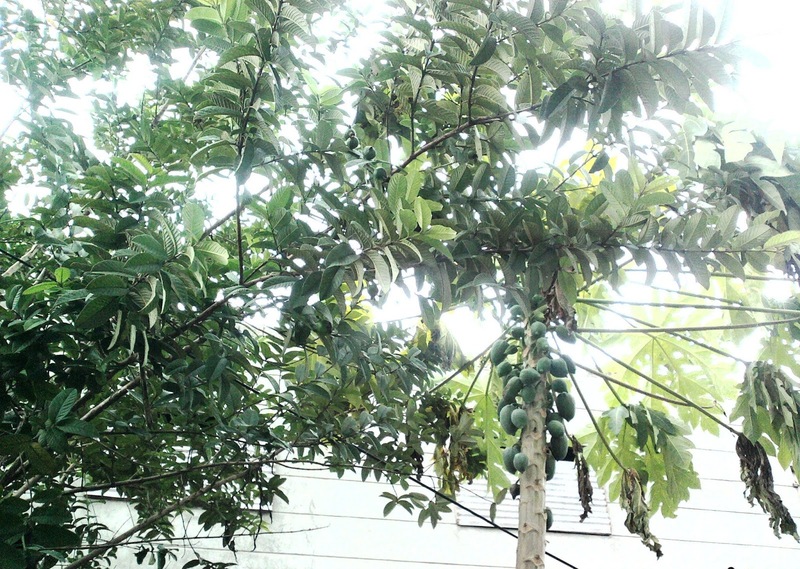 This guava or bayabas tree (pictured below) was already there also but it’s only in the past month that it had fruits on it. Our neighbors kept asking for some when they see them and we give them also. I’ve tasted it and it’s good. I’m not really fond of guavas but I would eat it primarily for the benefit of getting a natural dose of vitamin C.
Aside from eating the fruit, we also use the leaves for healing purposes. There had been occasions that my husband and son had burns/wounds on their legs because of touching the motorcycle exhaust pipe. We boil the leaves and use the boiled water to wash the wounds. It helps the wound to heal faster. If you notice the papaya tree pictured beside the guava tree, here are the fruits from that tree. We did not plant that, it just blossomed and it had plenty of fruits perhaps more than 20. However, this one is short lived. After producing fruits, it slowly dried up. Sayang. Anyway, we gave many of the fruits to our in-laws and neighbors and we had the chance to cook some in Tinolang manok as well as ginisang papaya with sardines. 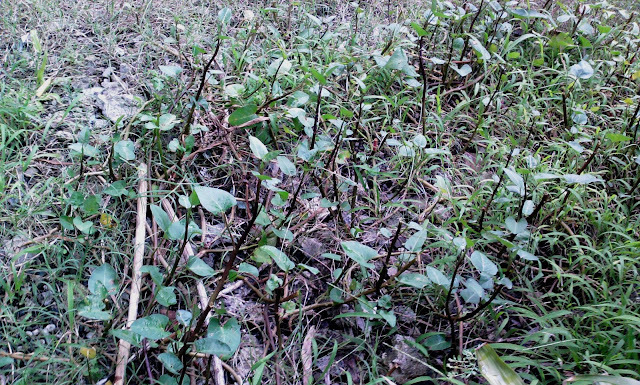 The plant below is the lagundi plant. I’ve already mentioned it in a previous post when I talked about the garden in our parent’s house. I really wanted to have this plant in our home as well so when we last visited my parents, I asked for a pot with soil and my father inserted into the soil a freshly cut branch of lagundi from their plant. I really hoped that we could make it grow. The only instruction my father gave is to put it in a shady area and of course water it. Initially, all the leaves of the branch dried up, so I thought, it won’t grow anymore. But I still told my children to talk to the plant so that it would grow. One day, I was so glad to see budding leaves from the branch. It’s been about 3 months since and this is how it looks now. 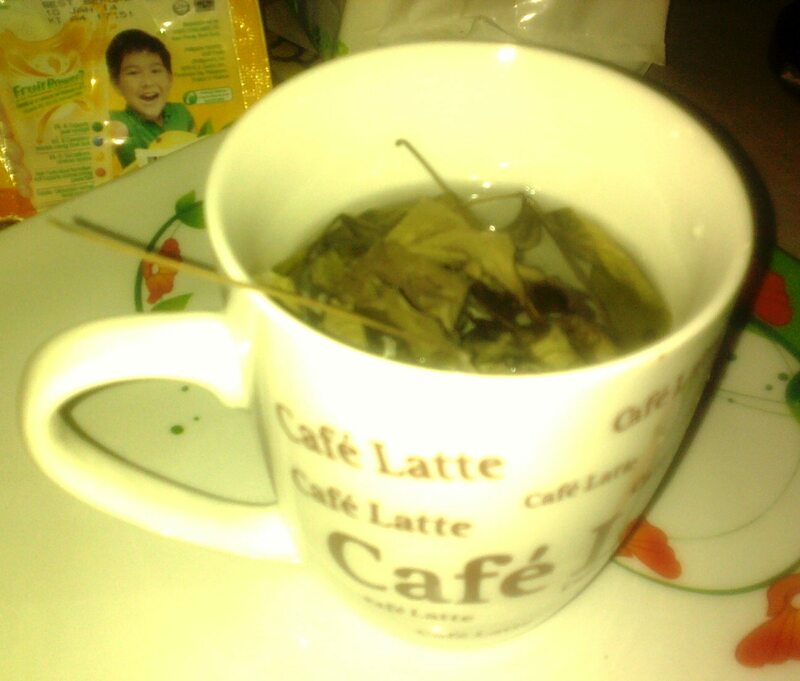 I actually use the dried leaves to make lagundi tea. 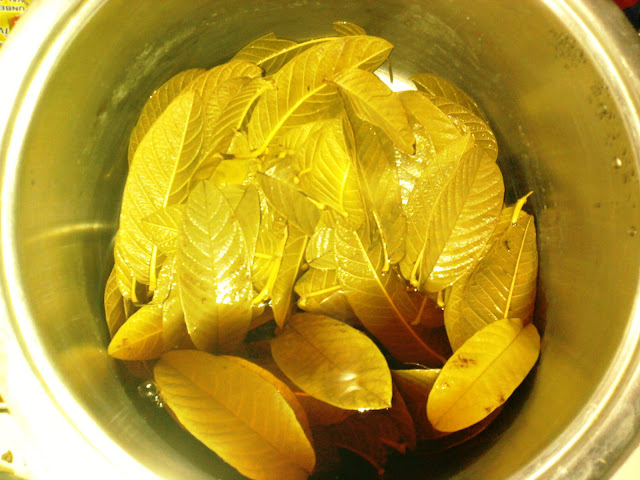 I could boil the leaves for about 5 minutes and then I either add honey or a bit of juice powder so that my kids will drink it. It’s good for treating their cough and loosening the phlegm. Sometimes, I also just boil water, add a 2-3 leaves and cover it for 5 minutes. After removing the leaves, I can drink it or add honey or juice. Lastly, this is where I get the kangkong leaves when we cook sinigang. I used to buy kangkong from the market but I thought of planting instead to save money. I just gathered the stem of some of the kangkong I bought and immersed them in water. When they had roots, I transferred them to the soil and it started growing. The more you harvest the leaves, the more they would grow. 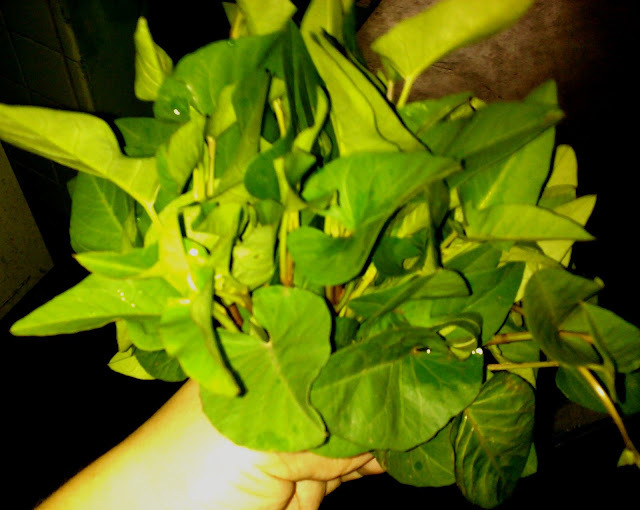 What we have is not really much but enough to give us kangkong to cook once or twice a week. These are what I harvested yesterday and cooked for sinigang. I didn’t know that kangkong had lots of health benefits aside from adding fiber to the diet. It actually provides amino acids, iron, calcium, vitamin B and C. It can also be used for treating fever, skin diseases, liver disease and diabetes. You can read about that here. Do you have fruit trees or vegetable plants in your front or backyard? Aside from helping to give fresh air, they are good sources of healthy food. It helps to save some cash too. we have an avocado tree in our backyard but i dunno if it’s still bearing fruit. so far what is most utilized are the malunggay tree and the lemongrass pots. very handy when we cook veggies. I also would love to have avocado. We also have malunggay which many of our neighbors ask from us. You did an excellent job introducing us to some healing herbs and delicious fruit from your garden… I enjoyed this post. Kristine, your parent’s garden is much like that in my parent’s house. Papayas are very easy to grow. They just sprout even if you just throw the seeds on the soil. unfortunately, we don’t have that much area in our subdivision but hope to get area to be used for garden. 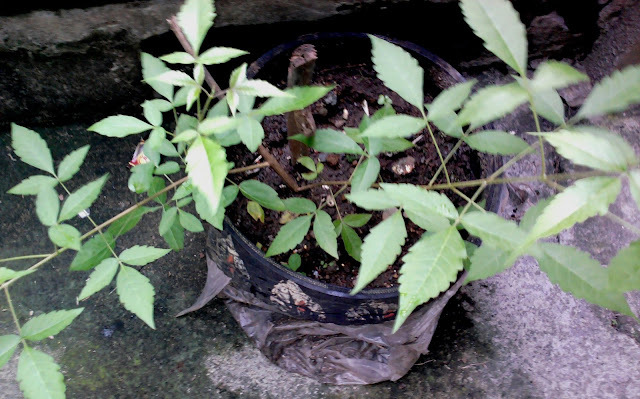 I forgot, I also have bankok sampaloc planted on big pails. It is nice to plants around the house and garden. Not only it is refreshing to the eyes but also refreshing to the purse! imagine having all those veggie and fruits for free? that is indeed a blessing! Totally agree. I personally would like a real garden but somehow I have not done much. But even a little helps a lot. Thanks for leaving your thoughts, Glenda. It’s really great to have a fruit and vegetable garden in the backyard. It could also lessen your grocery bills. Back in my childhood we usually spend time under the guava trees because of fruit abundance, yung mga puno na tumubo nang dahil sa pagkakalat ng mga ibon. Pero ngayon madalang na makikita ang native guavas. 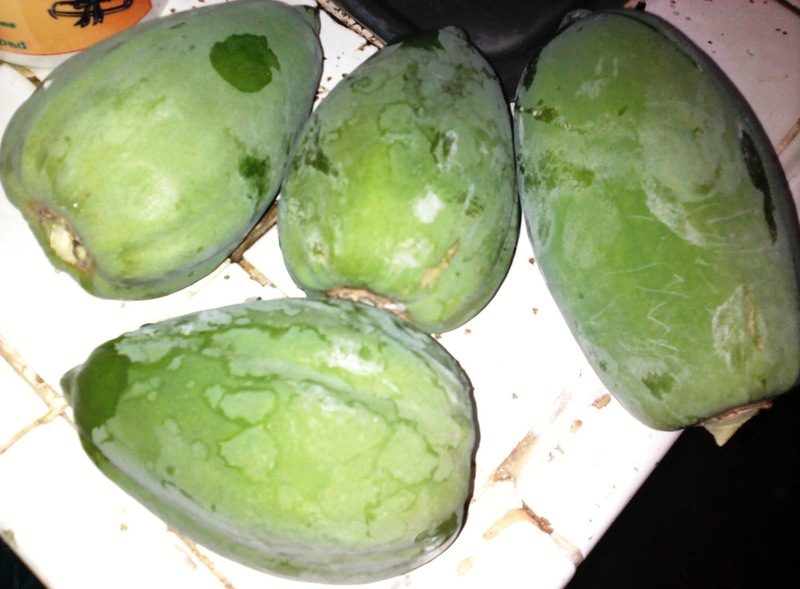 you can also do your own atsara with the green papayas. i have been telling my parents about creating our own small consumable garden instead of taking care of indoor plants. medyo matrabaho daw.. example, when the ampalaya bears fruits, you need to plant anew. but i’d like to have my own green wall in the future. It does require some work. I do pull out the weeds also. i wish we could have a garden in our backyard, but the soil is not healthy..
We also have not gotten good soil for our yard. Just used what’s there. Buti na lang tumutubo. 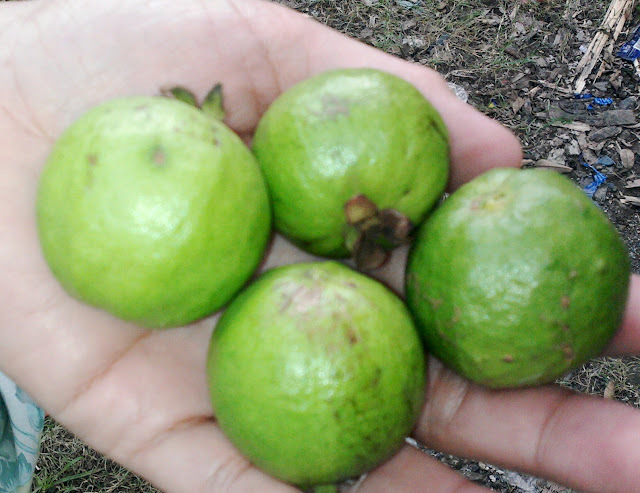 I’m sure your guavas taste delicious! I’m pretty sure most garden-grown fruits are. We used to have a guava tree in my childhood home, and all our guavas taste so juicy and sweet, unlike those sold in markets. It’s a sad thing we don’t have large grounds in our present home. This is the reason why I always want to have a huge garden. I want to plant trees, plants and vegetables. Maybe in time when we acquire a lot so for now, I need to be contented with planting on pots, hehe..
It’s also ok to plant in pots. At least you can rearrange if you want. Sayang talaga atis namin. Namatay last year after the habagat flood. Wow. That’s a lot of fruits. I want to have guyabano here also, not just because it’s delicious but also has healing properties.